At least that’s how the Times quoted the remark; the Herald-Express related it somewhat differently, but to the same effect. The following information on the interplay between Dockweiler and the county’s largest voluntary bar association is pieced together from accounts in those two newspapers, as well as the Examiner and the Daily Journal, a legal trade paper. Dockweiler had said he wanted to rebuke the bar to “its face,” and Herbert Freston, president of the Los Angeles Bar Association, quickly responded by inviting the DA to come before the Board of Trustees at noon on Dec. 18 to speak his piece. “It has been my privilege to have been officially and actively associated with the Los Angeles Bar Association, either as a member of the board of trustees or as an officer, for the period of at least five years last past. “During that entire period, while you have been a valued member of our association, you have not, so far as I can now recall, ever attended a single meeting of our association. Dockweiler agreed to appear before the board, but declined the immediate invitation, already being slated to speak at that time before the Lawyers’ Club. At the Jan. 15 meeting of the board, Dockweiler was the speaker. He did not tell the trustees to their faces that they were “gutless and spineless.” Instead, he complained of the proliferation of administrative bodies, comprised of nonlawyers, engaging in adjudications. “The President’s veto indicates that the public does not trust the courts to handle social equations. He urged the 14 lawyers attending the board’s lunch meeting to become more aggressive in protecting the bar’s interests, such as effecting a clamp down on the unlawful practice of law by banks and others. “Attorneys are not fighting to keep their business. “They are not fighting to keep themselves together. Speeches, unlike movies and plays, usually don’t attract reviews, but this one did, and the Times panned it. Also drawing a dissent from the Times was Dockweiler’s stance, taken on Jan. 9, 1941, that bookmaking should be legalized and licensed to get professional gangsters out of the business and raise revenue for the state. The Times and the competing morning newspaper, the Examiner, both carried summaries of the supposedly secret testimony in their Feb. 20 editions, based on leaks. The Examiner comes right out and says that information came from members of the panel. The basic information is the same, but the slant the rival newspaper took in the telling was markedly disparate. The Times’ story zeroes in on Dockweiler’s testimony that Cooper diverted $800 from county coffers to the pocket of an ex-convict in defiance of a specific order not to buy the man’s cooperation. The ex-convict was bookmaker John Osborne, who had earlier told grand jurors that he had received $100 payments weekly from Clifford Clinton (a radio broadcaster and political insider) for eight weeks, then received $50-a-week stipends directly from the District Attorney’s Office. Osborne was cooperating in an investigation of Charles Rittenhouse, the head of the sheriff’s vice squad to whom Osborne was paying protection money. 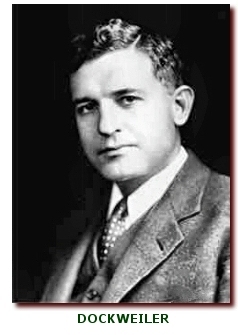 According to the Times, Dockweiler testified that he had been tipped off by Assistant District Attorney Clyde Shoemaker that Osborne might be receiving moneys derived from the DA’s “secret service fund.” In going over the books relating to that fund, he found disbursements to one “Clifford Hughes.” That was a fictitious name, Dockweiler learned in questioning Cooper; the payments were actually going to Clinton (proprietor of the Clifton cafeterias), then passed on to Osborne. “The District Attorney then explained how he became irate at the then existing situation calling attention to his former refusal to pay Osborne anything for his testimony,” the Times’ Feb. 20 article says. “Members of the grand jury stated that Dockweiler’s testimony yesterday had surprised them greatly because, they said, in his conversation with certain of their number Tuesday night, the District Attorney had denied that he had ever given his consent to Cooper to pay Osborne. Cooper and Clinton were indicted on Feb. 26 on five counts of falsifying the secret service fund records and one count of wire tapping in connection with a surreptitious Dictaphone recording made at Clinton’s house of a telephone conversation between an informer and a police captain suspected of being on the take. Cooper, Los Angeles Police Chief Clemence B. Horrall and LAPD forensic chemist Ray Pinker (later portrayed in some episodes of the original “Dragnet” television show) were charged with six counts of wiretapping in connection with the same case. Others were also indicted for wire-tapping, and Los Angeles mayor Fletcher Bowron faced an ouster proceeding based on alleged complicity in electronic eavesdropping in City Hall. Cooper had run Dockweiler’s campaign for district attorney. FOOTNOTE: A visiting Superior Court judge from Sierra County on April 8, 1942. quashed the indictments, holding that no illegal wire-tapping occurs where one party to a conversation has consented to it being overheard or recorded. This was different from the ground urged by Cooper: that there was no wire connection to telephone circuits—rather there was pick-up of conversations through use of an induction coil—hence there was no wire-tapping. The misconduct charge against Bowron had been quashed by McIntosh a week earlier. Cooper went on to become Los Angeles County Bar Assn. president in 1960 and American College of Trial Lawyers president in 1962-63. He was chief trial lawyer for Sirhan Sirhan, slayer of U.S. Sen. Robert Kennedy.